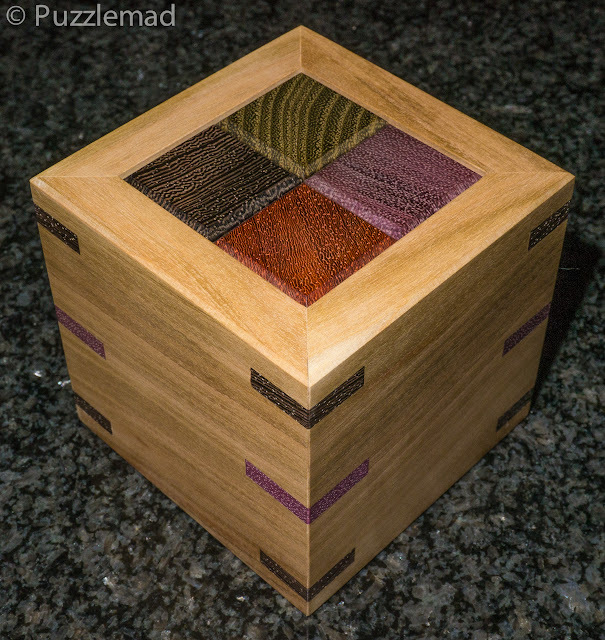 PuzzleMad: Yet Again a Solution without Understanding! Yet Again a Solution without Understanding! The size and quality of this blog post may well be reduced today - I have a hideous mix of Man flu and Ebola aka "Manflubola" which has resulted in large quantities of technicolour mucus and assorted nasty noises emanating from my person. This has very much annoyed the present Mrs S and she has utilised the laser burning stare many many times. Luckily she has decided that I am too infectious to get close to and so a Whack! Ouch! has not occurred.....yet! To make things worse, it is her birthday today and if I know what is good for me, I had better pay her some attention and not spend too long on puzzle stuff. If there are no more blog posts after this then please have her arrested and search for my body....it may be in pieces! 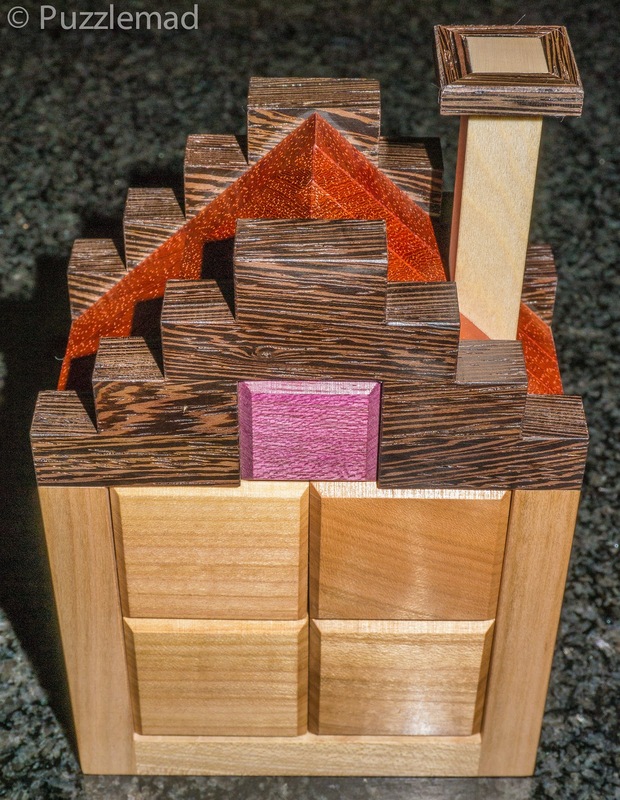 Way back in 2012 I published an article that I have referred to many times over the subsequent years about how a puzzle is only really properly solved when it is understood well enough to be able to do it repeatedly and without error. The puzzle that led to this statement was none other than the wire version of the Gordian Knot (not to be mixed up with the plastic board burr bearing the same name). 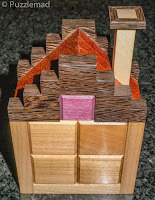 The original puzzle does not seem to be stocked any more by Puzzle Master in their wire puzzles selection which is a shame because it was a terrific challenge. 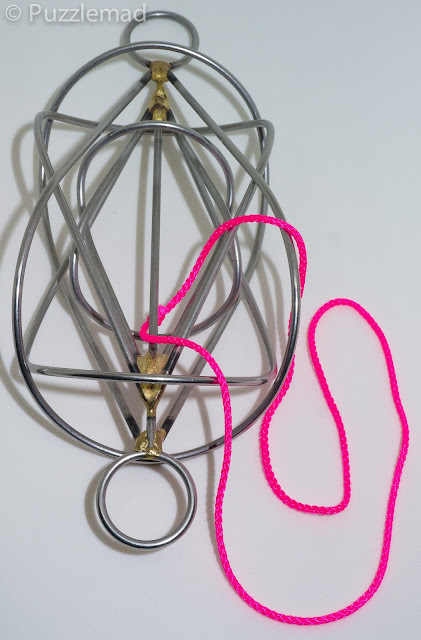 It took me a very long time to be able to say that I had solved the Gordian knot and I was pleased to be able to put it away knowing that it was truly done. At the end of last year I received a new consignment of wire puzzles from Wang Yulong in China and have been working my way through them but reached the point where I was well and truly stuck. I put them down (I had left them in my work bag and forgot about them) whilst I focussed on various burrs and other new acquisitions but the "call of the wired" always kept me picking them up and wistfully failing to solve them. One of the most frightening of all was a more complex version of the Gordian knot which had extra loops on it just to make it harder! I have played with this for months and always shied away when things began to get very tangled up. Eventually, I couldn't stand it any longer and made a determined attempt to solve it. I knew from my previous puzzle experience and from reading Goetz' compendium of N-ary puzzles that this was supposed to be a logical sequence based on Gary binary code. Looking through Goetz' pages I could see that this was very similar to his Gordian Knot 6 and and the Electro 1 which are Ternary. Over the last week I played and played with it getting a few steps in and getting confused and ending up back at the beginning by accident or getting a few steps further and being a coward, backing out. Finally I made a concerted effort under the influence of a cold remedy and a large glass of wine and suddenly the string was out! Mrs S was doubly annoyed with me because along with all the snorting noises I had been making I let out a big shout which ended in a coughing fit and upsetting her concentration! After I recovered from the laser burn, I put the puzzle down so that I could take a photo the next day. I did not feel the urge to reassemble it straight away before I forgot how because I had absolutely no idea what I had done! As usual I prove that I am not terribly bright! The following evening after the photos, I started to reassemble it and was surprised that I could get about half way without any problem and then could go no further. Each time I tried to progress I ended up with the string removed. This was a problem that was starting to panic me because I had no solution diagram and as a bespoke puzzle none would be available for download! It took me 2 days to reassemble it with much effing and blinding and when it was back together I had another quick drink of wine and swore that I would not be taking it apart again! Yet......the lure of the puzzle.....and I remembered my initial article and picked it up again. I am now able to remove the loop and put it back pretty much every time by just sort of weaving through but not really understanding it. So far I have done it about 10 times (it takes me a good 20-30 minutes each time) and am no closer to understanding the N-ary/logical sequence in it. The one thing I love about the N-ary puzzles are the discovery of the magic sequence and then using a rhythm to solve it. Last week's Delirium 13 review was all about the sequence being understood and followed.....for a VERY long time. In the end I emailed Goetz about it and as a good puzzle friend (I was his exchange assistant at the London IPP) he provided me with a very long and detailed explanation of the puzzle. I am having to work through it slowly because his mathematical skills are much greater than mine. I haven't reproduced it here but may do so in the future with his permission but he is thinking of turning it into an article for the CFF journal. All in all the Gordian knot and it's more advanced brother is a brilliant puzzle. They occasionally come up at auction made by Rick Irby and are well worth acquiring if you can. I now need to find some way to acquire the even more complex Devil's cradle which is one level higher with 4 pairs of loops - if anyone has a copy to sell then please Contact Me. My friend Jakub Dvořák of the New Pelikan Workshop posted on Facebook that he had a couple of new additions coming up for sale. Of course I couldn't resist them and they arrived yesterday. My advice is to go there and BUY THEM NOW! 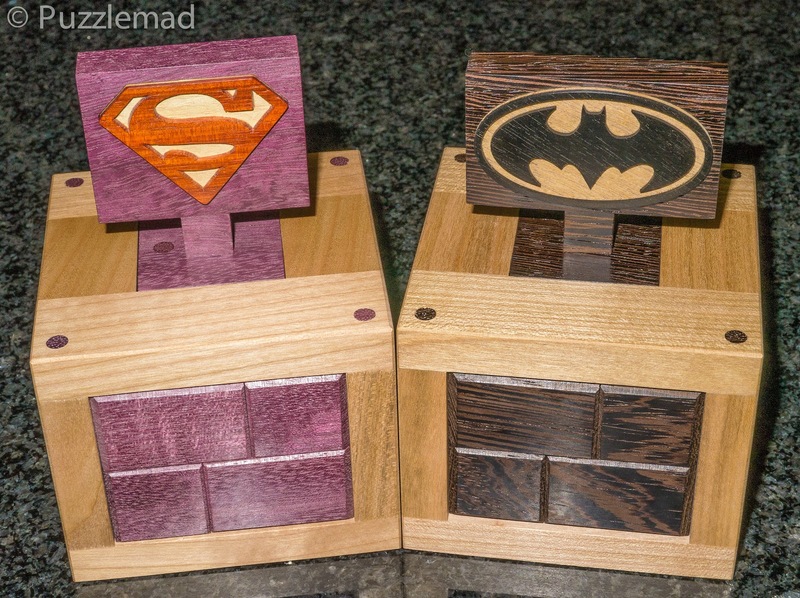 These puzzles are simply stunning. Gravity was designed by Tim Alkema, a relative newcomer to burr design, and this one is just fabulous (I reviewed his Padlock Burr last week). It is not a super tough puzzle at level 14.2.2.2 but has something really unique and fun about it because it requires you to visualise the hidden 2x2x2 block inside and move it around under gravity to unlock the piece movement. 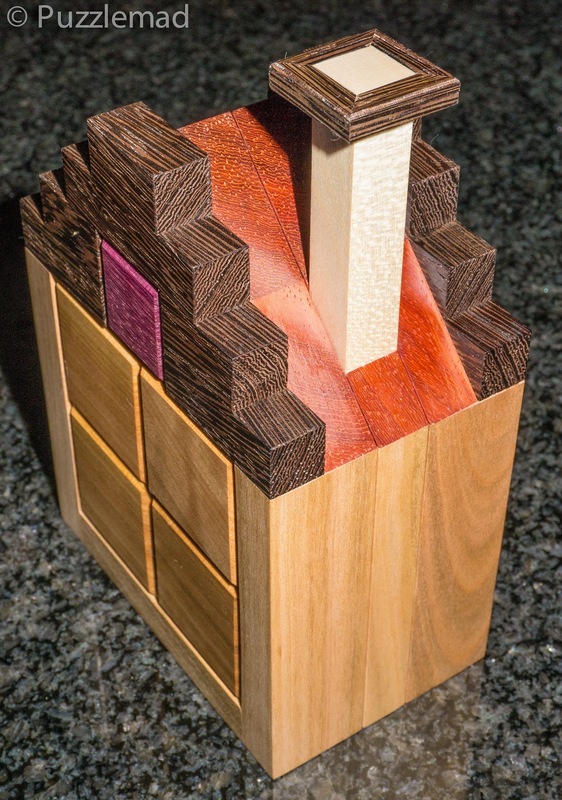 Made from Cherry, Wenge, Purpleheart, Acacia and Padouk it is simply gorgeous and the block piece is a wonder to behold. "Gravity has easily become one of my favorite designs because of its unique and interesting solution. I was inspired to make this design after receiving so much interest in another one of my designs involving a hidden piece. I think Dario Uri put it best: “The title already explains the type of movement. During the solution process the small cube "falls" four times moving invisibly inside other pieces. Fantastic!" I agree with Dario - Fantastic! Putting it back together is just as much fun! No need for Burrtools. Just look at that block! This puzzle is a limited run puzzle and will sell out quite quickly so you may want to grab it soon. Even Mrs S has agreed that it is beautiful and can be allowed out of the study (renamed as the Puzzletorium). I have yet to solve it - the design was made with the aim of being tough but not impossibly hard and this is perfect for me. As I explained last week a good puzzle is not just about sheer number of moves, it is also about exploration, fun and beauty. This really fits the bill. Whilst you are at the Pelikan site, have a look t the superhero burrs by Dan Fast - they are also limited edition and some are still available. 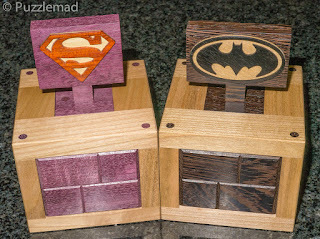 I have yet to solve Batman (I'm stuck) and haven't tried Superman yet! Now I had better get back to Mrs S before she loses her temper and finds some way to replace me with a more attentive husband! I've never seen one of those to play with William but if one comes up for sale then I'll certainly try and get hold of it! It's topologically equivalent to Chinese Rings, I think. But it's easier to see the similarity between the Staircase and Gordian Knot. It is easier to see but the Chinese rings are based on Binary Gray code whereas the Gordian Knot is Ternary. 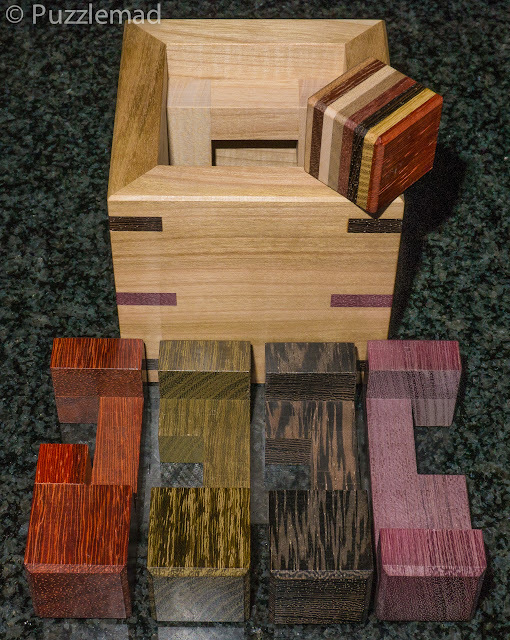 In any case I lurve this group of puzzles! 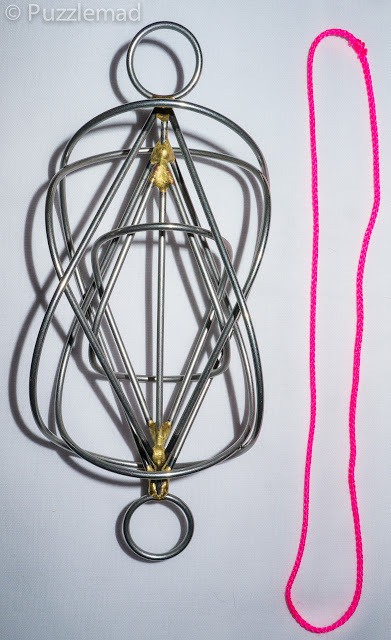 I have a Gordian Knot puzzle (by Professor Puzzle) which looks functionally identical to yours. I "solved" it once by perseverance and chance and eventually managed to reset it too. I solved and fully understood Chinese Rings as a child and your talk of binary and ternary logic has me intrigued. I must dig the Gordian Knot out again for another try! That is one puzzle I have been back to a few times. Especially when I managed to get hold of an even more complex version. Not Just a Lowly 6 Piece Burr!